Lucky Bingo HD is the luckiest Vegas casino style bingo game! Play bingo live against your friends on any device for FREE! Lucky Bingo has the BEST ROOMS, AWESOME CARDS, and the COOLEST CALLERS! Use Power-Ups to enhance your gameplay! DOWNLOAD FREE! 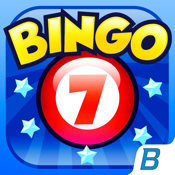 The best Facebook bingo game is now available on your iPad! ► WIN free tokens and coins! ► UNLOCK great new Rooms! Play LIVE on Facebook and Mobile! Don't wait... Play Lucky Bingo TODAY!